The Lyman Estate is a popular venue for weddings and other private events, and its newly upgraded catering kitchen will provide a more energy efficient environment. A new custom-made stainless steel cover protects the soapstone sink and provides additional counter space. Other new features include a two-bay sink with grease trap and hand-wash sink, a new convection oven (one of the most energy efficient models available), and a new counter-height refrigerator and freezer. Elsewhere in the mansion, the chandelier and sconces have been re-installed after conservation work, all in advance of the first wedding in the mansionon April 28. You don’t have to be a guest at a wedding at the Lyman Estate to see the mansion in its newly restored condition. 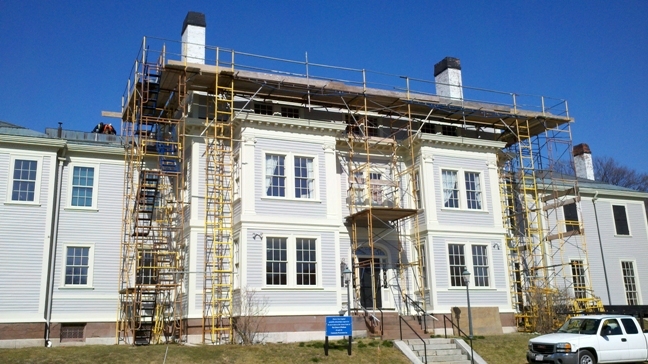 Historic New England offers tours of the mansion beginning in June. Funding for this project was secured through the Department of Energy Resources, Community Preservation Act funding through the City of Waltham, and Historic New England’s Preservation Maintenance Fund. Learn more and consider supporting projects like this at our thirty-six historic properties.